Nineteen-year-old Langley is crazy...like get out the straight jacket and prepare the padded room kind of crazy. She knows it, and the kicker is--she's choosing to stay that way. She clings to the persistent and intrusive hallucination of her dead sister by choice. Sure, it might be nice to live life in the real world. But not if it means she has to let Sarah go. Tupper's life is charmed. He has loving adoptive parents, and several athletic college scholarships on the table. But his passion is for the arts, for the beauty of solid ink lines on paper. His illustrations are eerily similar to a keepsake from his birth mother, Anna: comic-book-style drawings scrawled across an old map...her version of a travel diary. At eighteen, Tupper sidesteps his planned future and starts his journey where Anna's ended--following her map from Kansas City to Canada. His travels will put him on a collision course with Langley, and their bond is palpable from the start. But secrets will push between them--Sarah and Anna, two ghosts who could sink their icy fingers into the teens and tear them apart. 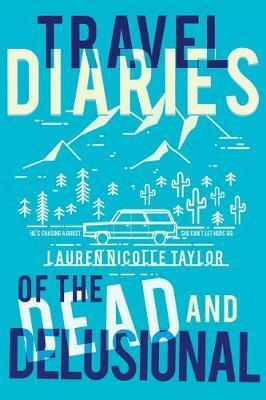 Perfect for fans of Colleen Hoover's Hopeless and John Green's Paper Towns, TRAVEL DIARY OF THE DEAD & DELUSIONAL is a unique and robust novel that explores themes of mental-illness and self-discovery from three distinct perspectives. Lauren Nicolle Taylor is the award-winning and best-selling author of Nora and Kettle and the beloved Woodlands series, among others.